I really need to come up with a name for this one: I've just been calling it Walls 2, and often my WIP name for a quilt sticks in the end, but I don't like this one at all. Hmmm... I've been puzzling over a name for a while and here are some thoughts: building a wall happens one block, one stone at a time much like a quilt is made one stitch at a time. So playing off that kind of though, maybe names like Stones and Stitches, Layers, Stacks, One at a Time, etc. It sounds like you've 'hit a brick wall'... I'd say this quilt is stonewalling you and refusing to communicate! Oh dear. I'll stop now. I love your circle. I really need to get back on track, with everything. I can't believe you're onto quilting another quilt already and I'm still jealous, mwaaaa! Love the colors! What about Building Blocks or Brick by Brick? Something that speaks to the process of building a wall? So glad you had another quilt to put in the hoop right away... wouldn't want to be stuck without one! Love the suggestions from Quilter Kathy, especially her first idea! Great colours and love the small piece of stripe in there. I like the colors of that quilt. Sorry, but I don't have a idea for the name. You have some entertaining suggestions for names here Kaja, LOL. I love seeing the close up of your faced circle with your wonderful hand stitching. 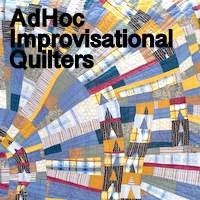 I love your hand quilting and stitching!